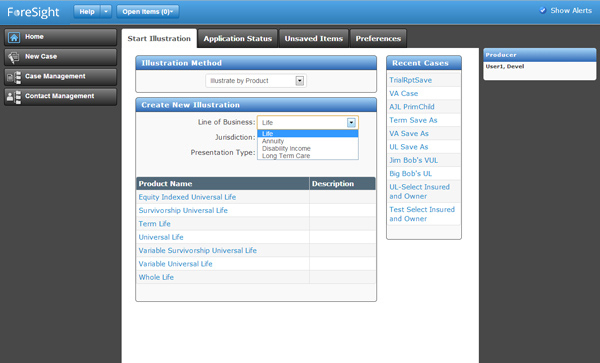 Optimize sales with intuitive insurance illustration software to create compliant and compelling new business and inforce illustrations that highlight your product uniqueness. 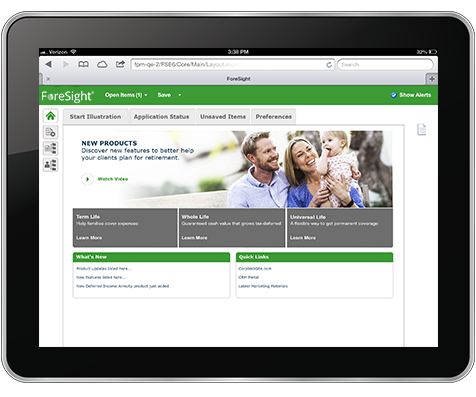 ForeSight® aligns illustrations with the way insurance and retirement solutions are sold. ForeSight is an intuitive and responsive point-of-sale insurance illustration software solution that supports key aspects of the sales process for multiple lines of business and product types across diverse distribution channels. With robust rules and pre-built sales tools, ForeSight delivers a dynamic and guided sales illustration process, producing compliant and compelling illustrations for annuities, life, long-term care and more. Highlight your product differentiators and provide a clearer picture to prospective and existing policyholders with ForeSight. ForeSight insurance sales illustration software solution enhances the marketing and selling of all insurance and retirement products by providing robust sales capabilities that enable advisors to quickly access and showcase your product strengths and provide holistic financial solutions that meet clients’ needs. Leverage the robust features of ForeSight sales illustration software to get products to market faster, while advancing the way distribution promotes and sells your products. With ForeSight® point-of-sale illustration software you can provide your producers anytime access to customized, accurate and compliant information and illustration sales output for multiple lines of retirement and insurance products. Illustrate all life insurance products and support your sales force with in-force illustrations and advanced sales concepts. Support individual life, multi-life and voluntary group life from a single enterprise illustration system. Provide a suite of integrated sales tools to produce compliant and compelling illustrations that highlight your products’ robust benefits, multifaceted features and competitive pricing for all annuity product types. 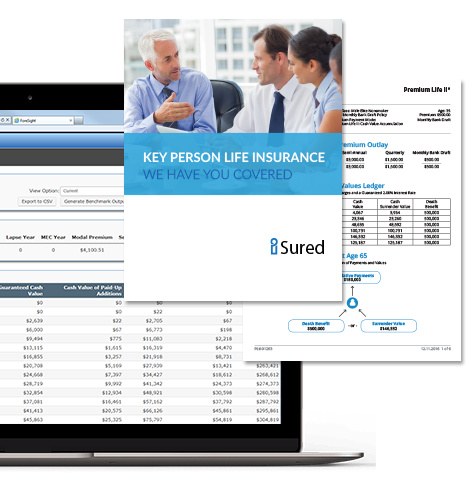 Create customized illustrations of retirement plans including qualified and non-qualified plans, individual or joint quotes, and integrate state-specific requirements with client-centric sales presentations with ForeSight. 1. Quickly demonstrate a client’s disability income requirement and illustrate where gaps in coverage remain to support client needs. Run quick product illustrations based on need and coverage requirements, providing additional sales capabilities.